Home > Will Olympic Swimmer Ryan Lochte Be Extradited to Brazil? Will Olympic Swimmer Ryan Lochte Be Extradited to Brazil? 32-year old U.S. Swimmer Ryan Lochte has 12 Olympic medals, second only to Michael Phelps among U.S. male Olympians. Unfortunately for him, Lochte has been indicted in Brazil on a charge of filing a false police report in connection with his claims of being an armed robbery victim. The maximum penalty is 18 months in prison, and Lochte could be tried without returning to the country. The case will be turned over to a special Brazilian court with jurisdiction over crimes related to major sporting events. As a threshold matter, a U.S. federal court would need to determine whether: (1) the offenses charged are extraditable; (2) the requirement of “double criminality is satisfied; (3) there is probable cause to believe the individual committed the offenses charged. The double criminality rule, which is a requirement in the extradition law of many countries, states that a suspect can be extradited from one country to stand trial for breaking a second country’s laws only when a similar law exists in the extraditing country. But ultimately, countries only honor extradition treaties when they feel like it. Brazil and the United States have an extradition treaty, but Brazil generally does not extradite its own citizens to other countries, and the United States could also refuse extradition. For example, the head of Brazil’s football confederation, Marco Polo del Nero, who faces charges in the FIFA scandal, will not been extradited. He has not traveled outside Brazil for more than a year to avoid being arrested by U.S. authorities somewhere else. According to some researchers, Brazil even took in between 1,500 and 2,000 Nazi war criminals, which it refused to extradite. Gustav Wagner, an SS officer known as the “Beast,” died in Brazil in 1980 after the country’s supreme federal court refused to extradite him to Germany because of inaccuracies in the paperwork. Dr. Josef Mengele, the “Angel of Death” who conducted macabre experiments at the Auschwitz concentration camp, lived and died in Brazil. But If an American Was Extradited, How Would It Work? All extradition treaties in force require foreign requests for extradition to be submitted through diplomatic channels, usually from the country’s embassy in Washington to the Department of State. If the request is in proper order, an attorney in the State Department’s Office of the Legal Adviser prepares a certificate attesting to the existence of the treaty, etc., and forwards it with the original request to the Justice Department’s Office of International Affairs (“OIA”). Once the OIA receives a foreign extradition request, it reviews the request for sufficiency and forwards appropriate ones to the United States Attorney’s Office for the judicial district in which the fugitive is located. The U.S. Attorney’s office then obtains a warrant, and the fugitive is arrested and brought before the magistrate judge or the U.S. district judge. Unless the fugitive waives his or her right to a hearing, the court will hold a hearing pursuant to 18 U.S.C. § 3184 to determine whether the fugitive is extraditable. If the court finds the fugitive to be extraditable, it enters an order of extraditability and certifies the record to the Secretary of State, who decides whether to surrender the fugitive to the requesting government. Although the order following the extradition hearing is not appealable (by either the fugitive or the government), the fugitive may petition for a writ of habeas corpus as soon as the order is issued. The district court’s decision on the writ is subject to appeal, and the extradition may be stayed if the court so orders. During the games, Lochte initially said that he and fellow swimmers Jack Conger, Gunnar Bentz and Jimmy Feigen were robbed on August 15 at gunpoint in a taxi by men with police badges as they returned to the Olympic Village. However, video surveillance showed the athletes getting into a confrontation with security guards at the gas station when their taxi pulled over to let them use the restroom. In the video, the swimmers are seen sitting on the ground with their hands up. While there have been conflicting versions over exactly what happened, Lochte has since acknowledged he was highly intoxicated and that his behavior led to the confrontation. And video surveillance from the Olympic Village showed Lochte and his companions “arriving without signs of being physically or psychologically shaken, even joking amongst themselves,” and with their wallets on them. Other reports suggested that the swimmers vandalized a bathroom at the gas station. However, an investigation by USA Today found no damage to the bathroom. Of the videos available, including footage from a camera trained on the restroom doors, none show the swimmers going near the bathrooms. Rio authorities have not offered any details about the guards at the gas station beyond confirming they are members of law enforcement who were working a private security detail. A key witness, Fernando Deluz, says he got involved after one of the guards pulled a gun on the men. Another swimmer, Bentz, said that Lochte damaged a sign during the incident and got into a “heated exchange” with the guards. Bentz also said the swimmers were held at gunpoint until they paid. “I gave them what I had in my wallet, which was a $20 bill, and Jimmy gave them 100 reais, which is about $50 in total. They lowered the guns, and I used hand gestures to ask if it was OK to leave, and they said yes.” While bystander Deluz and the police said the amount paid was for property vandalized, it is unclear whether the swimmers understood the situation, given their intoxication and the language barrier. What do you think? 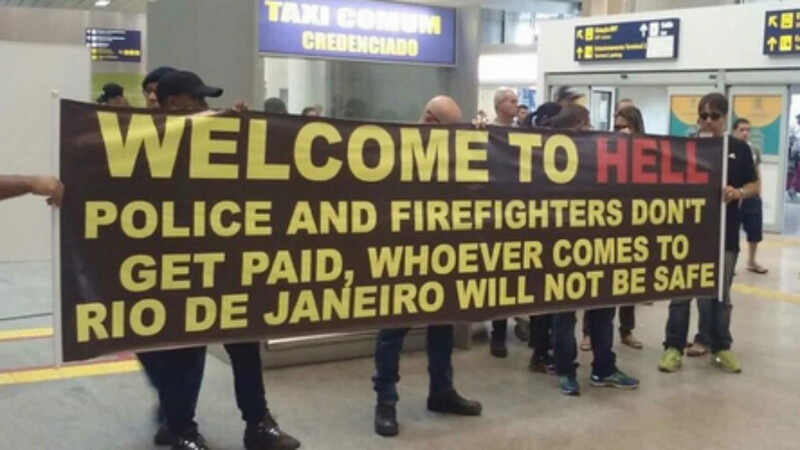 Are Rio police taking this too far? Or should Lochte be taught a lesson by having to go through the hassle of hiring lawyers and arguing against a potential extradition request?